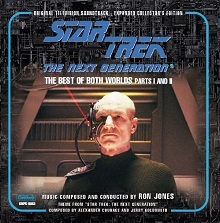 One of the undeniable highlights of television’s Star Trek: The Next GenerationTM (1997–1994) was the two-part episode, “The Best of Both Worlds” (the third-season cliffhanger and fourth-season opener). 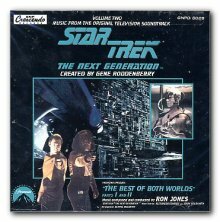 For composer Ron Jones, “The Best of Both Worlds” marked the apex of his impact on the first four seasons of Star Trek: The Next Generation—a thrillingly dynamic symphonic score that fits the episodes like a glove. 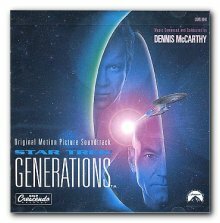 Jones’s achievement was so popular that it became only the second Next Generation soundtrack album released at the time of production. 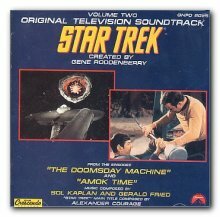 Although the complete score is infused with Jones’s customary musical craft, the composer’s chilling theme for the Borg, often voiced by eerie synthesized chorus, dominates “The Best of Both Worlds.” It forms the basis for some of the score’s exciting action-oriented material. 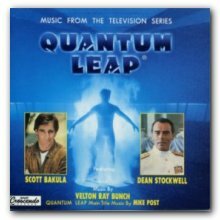 In the episodes’ quieter moments, Jones’ scoring is subtle yet melodic, with colors and harmonies chosen to evoke emotion without overpowering the onscreen drama. 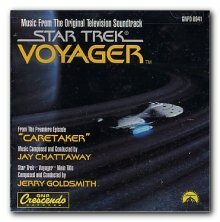 GNP Crescendo’s 1991 soundtrack album from “The Best of Both Worlds,” containing the major cues from both episodes, was enormously popular. 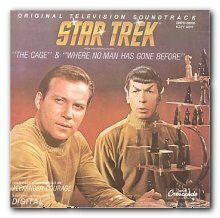 This Expanded Collector’s Edition, licensed by CBS Consumer Products, features the complete scores, adding the shorter, transitional moments that contain at least one piece of important thematic material missing from the original album. The 16-page booklet contains notes on both production and music by Lukas Kendall and John Takis—based on interviews with Jones and other primary source material. “The Best of Both Worlds” is a testament to Jones’s remarkable talent and creative imagination—and to the unconquerable human spirit that is the essence of Star Trek. 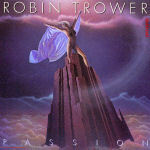 The Expanded Collector’s Edition CD is available for preorder, shipping beginning May 20th. Bolded items indicate previously unreleased material.